Materials fee of $20 inc. text block, leather, rare earth magnet, one tintype, waxed linen threads, needles, other needed project materials, use of tools, and handouts. Learn to make a beautiful and sturdy artist journal or sketch book whose longstitch structure is a favorite of many book artists. With a flexible, soft leather back, it uses few tools and no glue. 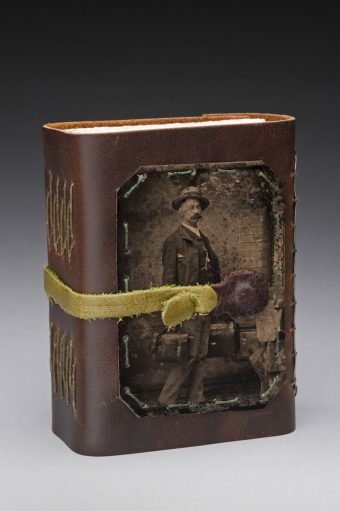 Your book will contain a variety of artist papers, all protected within the strong and supple wrapper, embellished with a tintype photo sewn to the cover, and secured with a magnetic closure.